Q. What is difference between Banner galore Plugin and Ad Opportunities with WooCommerce(current plugin)? A. 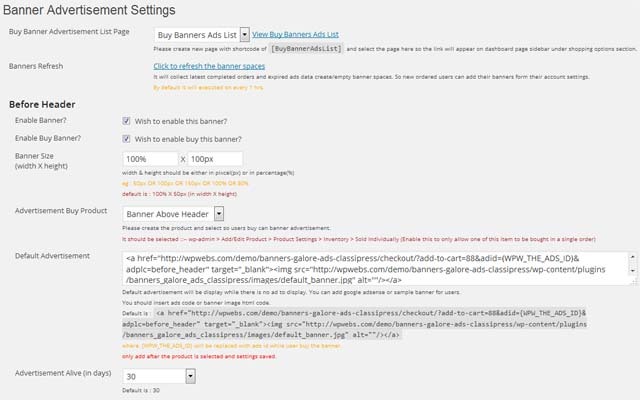 Banner galore plugin can be managed by admin only while current plugin can be managed banners either by admin or visiting users can buy it and manage. 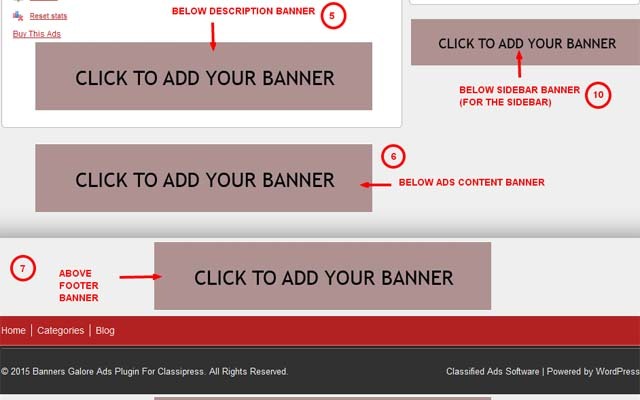 — This plugin is useful only site owner who want users to give facility to buy banners spaces and earn money. Q. Key Featured in Banner Galore Plugin (older classipress banner plugin)? A. 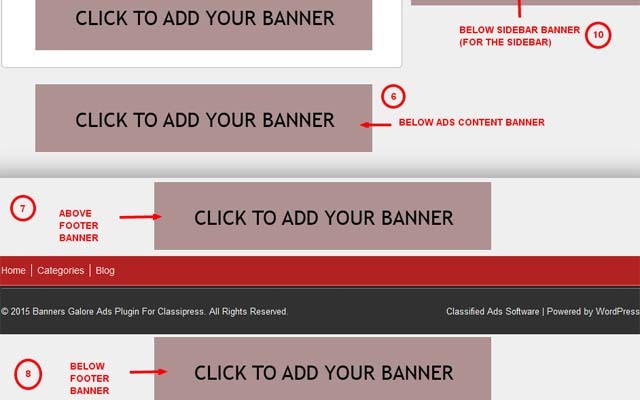 Banners can be display for whole site. Like home page, blog pages, category listing pages. — These features are not included in current plugin. — Widget for sidebar to display any number of banners in sidebars. — Easily display site banners as per suitable for site by admin. — While for current plugin user have to buy the banner space for each individual pages. — it will work for personal advertisement system or limited amount of advertisement on the site. Q. Key Features in Ad Opportunities with WooCommerce(Current Plugin)? A. 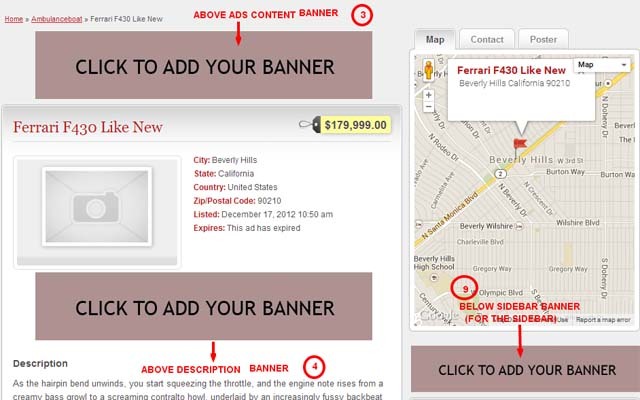 Banners can be display for each individual pages like home page, each listing pages & detail pages. — Users can buy and manage banners their own from my account settings. — WooCommerce plugin should be work properly on your site for allow users to purchase banner spaces. — More than one banner on same banner space by sliding effect. — Earn money buy banner spaces. — Once order approved, banner space will be activated on user account after one hour by cron job process. 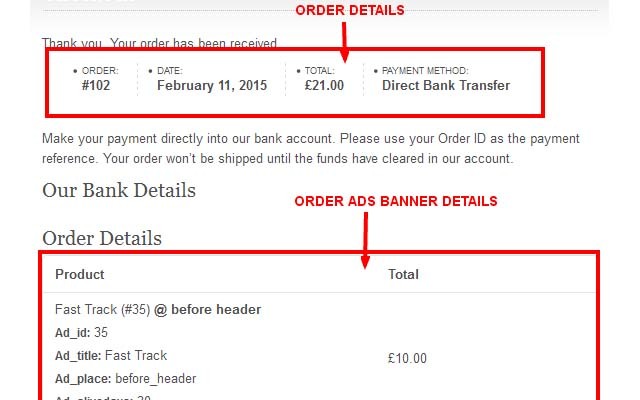 — No headache to manage banner and payment. — No limitation of advertisement. –So first you should try to install the WooCommerce plugin. –BECAUSE WooCommerce plugin require “SESSION” enabled and many shared hosting company not enabled so you first confirm that. Q. No refund in case of WooCommerce not working for your site. 2)Copy the plugin folder “ad_opportunities_with_woocommerce” and paste in “wp-content/plugins/”. 3)Go to wp-admin -> Plugins -> Ad Opportunities with WooCommerce for Classipress -> Active Plugin. 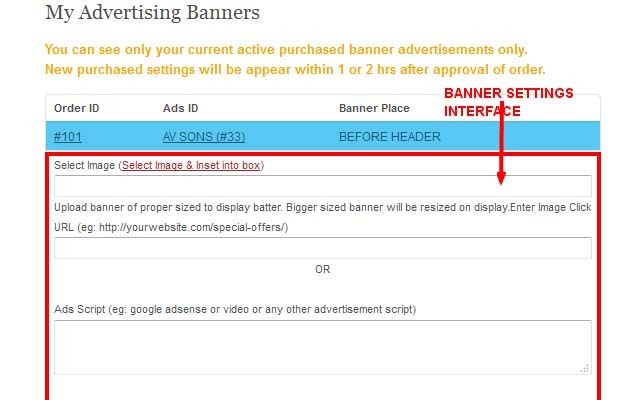 4)Go to wp-admin > Ads(Left menu) > Ad Opportunities Settings > Make settings as per want to display advertising banners & set default banner for users. 5)Install Woocommerce Plugin so registered users can purchase the banners spaces, place the order & complete the payment if you are going to charge. — Go to wp-admin > Ads(Left menu) > Ad Opportunities Settings > Make settings as per want to display advertising banners & set default banner for users. — Set the advertisement alive days, default is 30. — The banner spaces data managed by cron job automatically (cron job will be executed on every 1 hr). — Comma separated ads, post and page Ids on which page you want to block/hide banners space. — Admin can manually run the cron job from plugin settings page. — Admin can manage add/edit banner image, URL and advertisement script. — Admin can change alive days by edit the order & order product attributes. — Important settings are require while you creating new product for this plugin settings. — Create new product and add title and image if you want. — Add price as per you decided and the buyer will charged as per product amount added. — The important point is :: more than one banner on same banner spaces for single order are not allowed. Because banner data are stored with variable name of order_id, ads id and ads place combination variable. — So if any one need to display more than one banner ads for same place, he must place different orders. 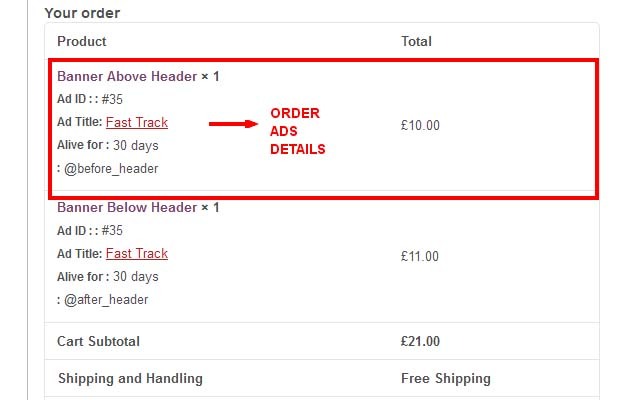 — If order placed with more than one item with one place of ads then it will consider as only single banner space and other order details will be ignored. 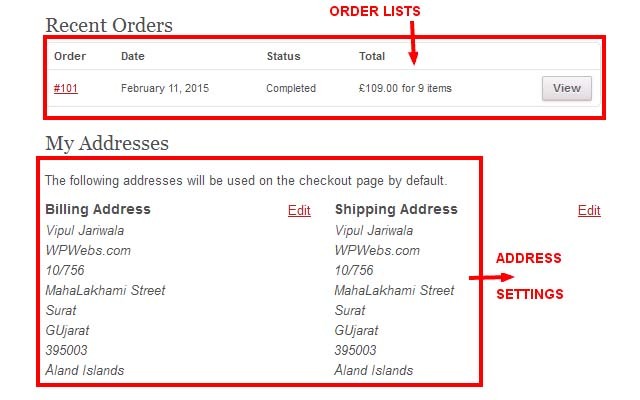 — Add Product price as normal WooCommerce product, while you add the product. — On “Publish” section(right side) >> Catalog visibility >> you should select “Hidden” to do not display the product anywhere on the site. — If you have activated the wooCommerce shop, those products are never display any where to any users. — Go to Dashboard of Classipress theme. — The links from Dashboard > Sidebar > Shopping Options will be added for wooCommerce. — Once the order completed(approved), user can see the manage banner section option under My account settings. — From where user can add/edit like manage the advertisement banners. — User can select & upload own advertisement banner image and link url. — In place user can add own html code like links, descriptions and any thing with basic html code only. — The banner advertisement data refresh after ever 1 hr it will add new completed order spaces and remove expired banner orders settings. The WooCommerce plugin should be installed if you want registered users to purchase the banner spaces from front side otherwise it will not allowed user to purchased. — Active the WooCommerce Plugin. 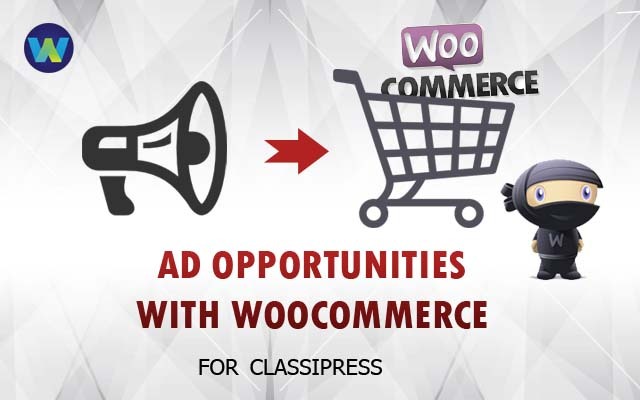 — Ad Opportunities with WooCommerce for Classipress Plugin. — Important settings are require while you creating new product of this plugin. — Create new product and set for settings. — Add price as per you decide and the buyer will charged as per product priced. — Because more than one banner on same banner space are not allowed for single order. Because banner data are stored with variable name of order_id, ads id and ads place combination variable. — If order placed with more than one item with one place of ads then it will consider as only single banner space. — Add Product price as normal WooCommerce product. — See the links from Dashboard > Sidebar > Shopping Options. — Once your order completed(approved), you can see the manage banner section option under My account settings. — To display the list of all ads for user to buy the banner spaces. — It will display all the ads pages there are public in your site so user can see it an buy ads as per they want. — Dashboard sidebar plugin links not display properly for child theme – Problem Solved. — Solved many php notice/errors. — Added new shortcode for site uses to allow easily display buy button page like category pages, tag pages and blog related pages. — Now the content before & after content will display only on detail (single) page not listings and other pages. — Banners Add/edit page descriptions changed for create new product from wooCommerce. — It should be virtual product by ::- wp-admin > Add/Edit Product > Product Settings > “Product Data” should be “Simple Product” and “Virtual” should be selected otherwise it will ask for shipping on checkout page. #1 what are the differences between this plugin and the banners galore plugin? #2 is there a way of keeping the ads hidden from users (or a blank space perhaps) untill the add is filled? in the same way that ad opportunities does? PS Great job on banners galore by the way.. i will adress on that page soon… thanks. The plugin difference you can see in FAQ section. The main difference is for banner galore you can add multiple ads from wp-admin easily and display for more than one place. Like above header ads for home,listing or for whole your site. while for this plugin you can add only one plugin per page. Mean home page banner will display only for home page not for any other page. The banner possibility is one only. 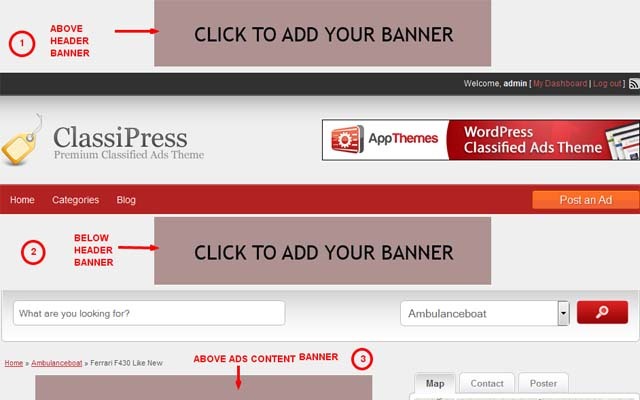 This plugin is useful for those who want to sell banner space and earn money. can this work with only classipress 3.3.1 without woo themes or woo commerce? The plugin can work with classipress 3.3.1 but not without WooCommerce plugin. To add new banner, you must add the woocommerce plugin. Admin only edit the banner cannot add new banner. 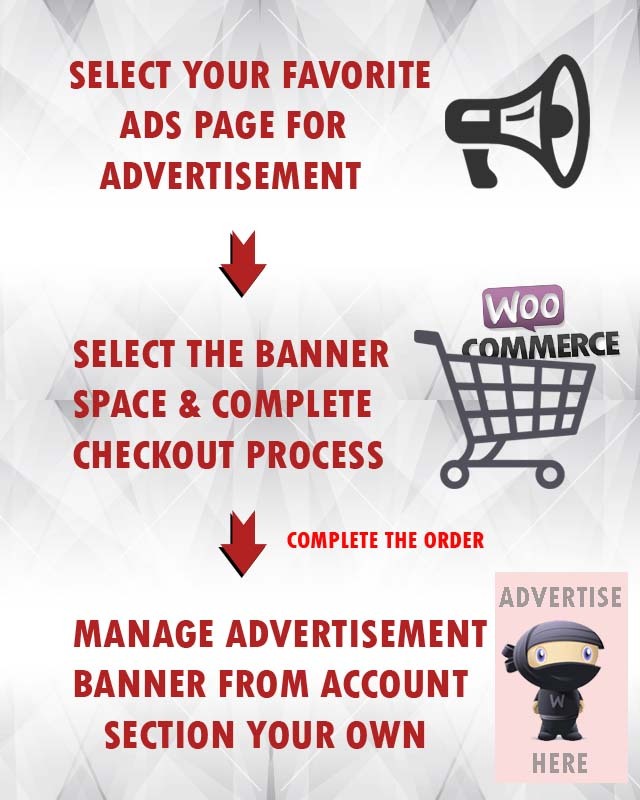 New banner add process is only from with woocommerce order system. If order is there then only banner will be added or managed. Yes you have hide buy banner link so user cannot able to purchase banners. Only admin can access it. Can I change the default buy link picture? You can change the default image url by adding and changing the default image url settings with plugin settings. Even the wooCommerce plugin is absolutely free. i tried woo commerce and it also have its own registration. Will there be 2 different registration in classipress? one is the default classipress, another is woo commerce registration? But how to find my page id? Oh, ye i see now. It’s working now. Thank’s alot mate, have a nice day. I send u mail mate with question. Hi Vipul, i hope u are well my friend. Just wanna ask, can u change my plugin abit? I mean, when someone click at the banner and it’s arleady not available becouse somone own this banner for exaple 30 days, so now if u have situation like this and u click, u have just empy cart, and i need instead of this message like ” this banner is not available now, will be available after xxdays” something like that. Can u do something like this or not realy? Thank u for ur time, and all best for u my friend. 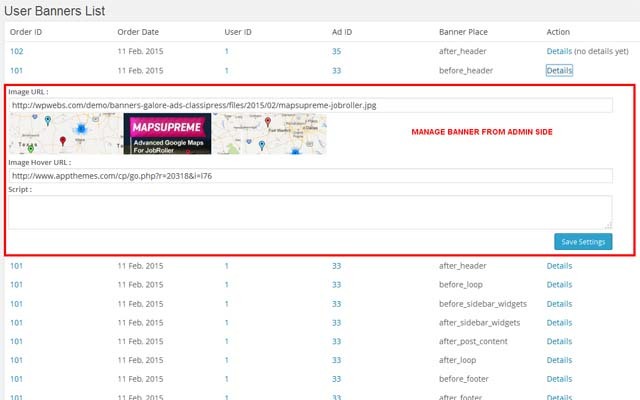 We cannot display any such date for expiration of the banners but you may do one thing display all active list of ads with expiry dates and make a page to display for public buyer. I think that is the easy way so buyer may get good opportunity and place for the advertisement. You may need developer help for that. ok I got email related to affiliate products, wooCommerce plugin feature. I have check your details and found that the product affiliate option is possible but for current version of plugin, this kind of feature is not added. I have to check and if possible will add for you. Because it will change frontend settings also. 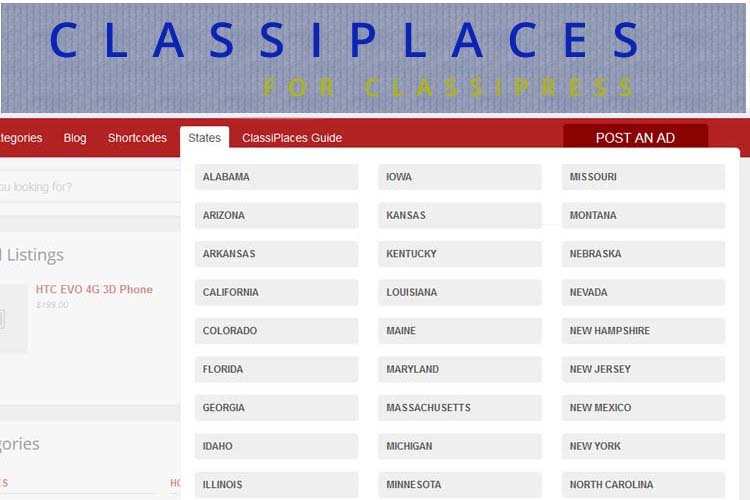 Yes it’s working with classipost and all child themes from marketpalace. 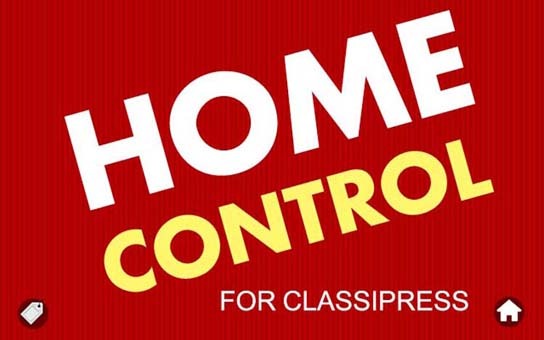 Hi, can the users purchase the banner spaces using the classipress payment gateway methods which are used for making payments for posting ads? Yes user can purchase the banner spaces but we are using WooCommerce as ecommerce background so it will use all payment gateways that supported by WooCommerce. Get more details about plugin documentation. There is not any relation between classipress payment gateway methods which making payments for posting ads and purchase banners….. both are different. We support wooCommerce plugin which is free and support many free payment gateways also. Thank you for your reply. Here is my issue: I am having the virtual wallet (custom-made) developed to make payment for posting ads (by integrating an additional payment gateway to classipress). I am planning to use the same balance/virtual money in the wallet to make payment for your “ad opportunities” products by auto-deduction of the balance. Do you think it will be easy to link? I think there are some woocommerce wallets. If I want to go with this woocommerce wallet route to make payment for your ad opportunities” products, do you think it will be easy to write codes for transferring money from classipress wallet to woocommerce wallet? I am hiring/paying a coder to do the coding since I know nothing about coding. Please let me know which one is the easiest way and how much coding can be involved. Ok I got your problem about make personal virtual wallet for ClassiPress and now you want to use same for other also. But as we are using WooCommerce your private wallet will never work for that. To make both wallet work equally with each-other is not as easy but by coding it is possible. It will better to ask the coder who developed your private wallet to do this. For him it will not much long and problem to add with new wallet. Because he know the own code better then new developer. Thank you for your reply. I don’t quite understand what you meant by “To make both wallet work equally with each-other is not as easy”. There are 2 possible routes below: which option is easier (1) or (2)? (2) transferring balance/virtual money from custom-made classipress wallet to a woocommerce wallet (comes in the form of plugin). Since you are a developer, I need your inputs so I can get the best and a fair price for the coding service from the developer of the custom-made wallet. Thank you very much for your time. As per your 2 question…. (2) first of check the wallet if it is better than your custom then of-cause use this. you may manually transfer fund to “ad opportunities” wallet also. So no need to develop any code but little work on every day. Hi, I have a default theme classipress 4+ with my own child theme modification. Is “ad opportunities” a theme or a plugin? Will it completely change the layout of my site? or it will only add blank ad spaces in some places for users to purchase? Thank you. ad opportunities — is only plugin which add extra spaces on your site which can be bought by users only. it will only add banners spaces not any layout change of your site. yes your last statement is correct….